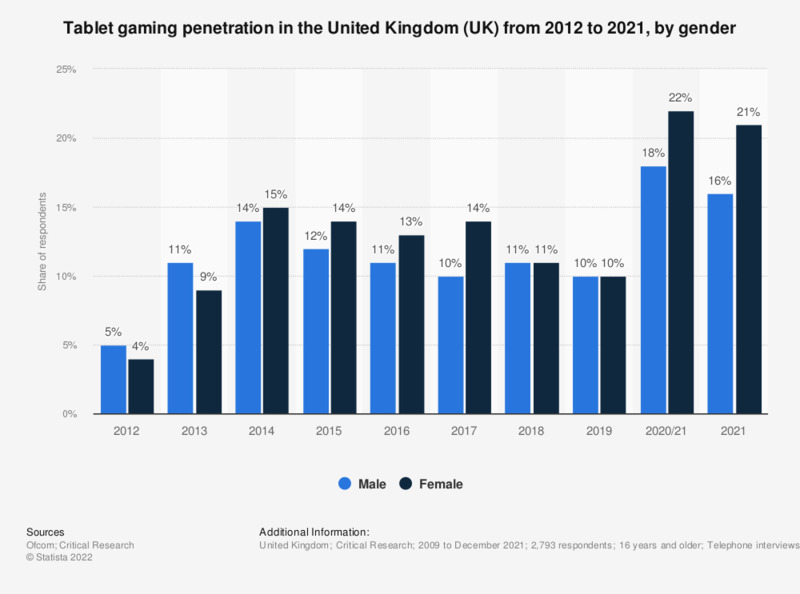 The statistic displays tablet gaming penetration in the United Kingdom (UK) from 2012 to 2017, broken down by gender. In 2012, 4 percent of female, and 5 percent of male respondents reported playing games on a tablet PC. The share of female respondents playing games on a tablet PC rose to 14 percent in 2017. * n (2012) = 1,805; n (2013) = 1,642; n (2014) = 1,890; n (2015) = 1,841; n (2016) = 1,846; n (2017) = 1,875. n (2012, males) = 893; n (2013, males) = 790; n (2014, males) = 927; n (2015, males) = 900; n (2012, females) = 912; n (2013, females) = 852; n (2014, females) = 963; n (2015, females) = 941, n (2016, males) = 885; n (2016, females) = 961; n (2017, males) = 909; n (2017, females) = 966 . ** Most recent survey carried out in September and October 2017.